It looks like Volkswagen is preparing to introduce yet another modernized Microbus prototype at CES next month, so I’ve been thinking about old Type IIs. 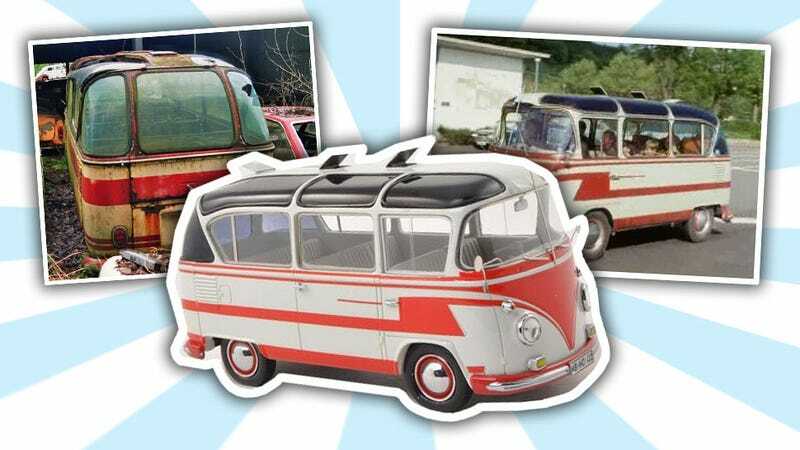 For a car as iconic and well-known as the Microbus, there’s a sense that it’s all explored, there’s nothing new to learn. And then you see a picture of an Auwärter Carlux. Is This The Name Of Volkswagen&apos;s Reborn Electric Microbus? When I discovered this thing, at first I thought I was looking at some Frankensteinian one-off, welded together in secret by a grizzled, wild-eyed madman with half a Microbus and the remains of a Greyhound bus wreck. But that’s not the case. There were actually 24 of these marvelous monsters built. The history of these buses is still pretty murky. I’ve heard they were built in Hamburg, though the company, Auwärter, seems to have been an omnibus/coachbuilder based out of Steinenbronn, and they were making tour buses and other sorts of bus-like vehicles as recently as 2004, when they seem to have gone out of business. Of the 24 made, only a handful exist, with some estimates as low as three. These modified buses date from the early ‘60s, and if I had to speculate (which I do, it’s imperative) I’d say Auwärter was looking for a cheap way to enter the small shuttle-bus/passenger bus market, and decided the Volkswagen Type II was a great place to start. Since Type IIs were already being used in this role in a number of industries, Auwärter figured they needed to step up and differentiate the basic VW passenger van. I suspect they used glass and other parts from their full-sized omnibuses to create something that felt more like a full-size bus, while retaining the footprint and economy of the Microbus. It looks like everything is new from the belt line up. The windshield is now made of massive, curved glass, the upper doorframes have been re-worked, the side glass is tall, and there’s a lovely panoramic set of curved windows out back. Everything arcs up and over the roof, giving more light than VW’s own 21-window bus, even, leaving just a narrow opaque path of metal down the length of the roof. The result is bonkers — gleefully, usefully bonkers. Strangely, all that curved glass (along with the kicky Z-shaped stripes and flashes these usually wore) actually made the buses seem a little older, looking more like a baroque 1950s-American take on the basic Microbus. The Auwärter Carlux version of the bus is a sort of Space Age take on the basic Microbus, giving it a cheery aplomb and slightly unhinged optimism. I love it. I also imagine that the experience of riding in one had to be pretty satisfying, with all those windows giving you a nice floating-fishbowl effect, and that enlarged rear hatch was probably useful for cargo loading as well. One does show up in the 1969 movieHeintje - Ein Herz geht auf Reisen (the Heart Goes on a Journey), which may contain the best period images of one of these things anywhere. Maybe I’ll find an abandoned one in 2016.